The Yacht Cruiser offers 7 Star luxury from top to bottom. It includes many features that will simply astonish. The Party Deck System is unique and offers a huge open deck for a wide range of sports and social applications. The Fly Cruiser operates at the forefront of performance through cutting edge design and innovation dressed with classic contemporary furnishings. If you need to go from A to B quickly and effectively, the Fly Cruiser Series is designed to respond to your needs effortlessly and on demand. At the touch of a button your marine experience goes into fly mode and lifts you from the plain and into free air to well over 100 knots. These ultimate hull designs have been evolved to irradiate vibration, bang and slap to literally smooth through the water no matter what the weather or sea condition. Ferrari F40? If you said an actual Ferrari F40, then you are dead wrong. The correct answer is a replica Ferrari F40 limousine. Fortunately (for us), such things actually exist. So where would one find such an automotive monstrosity? In Japan, of course! You know, the country that brought us the Mitsuoka Orochi, melon flavored chocolate and a pillow shaped like a kneeling woman’s lap. Ferrari F40 is awesome, it’s replica is good. How about a replica Ferrari F40 limousine? And you would go WTF? 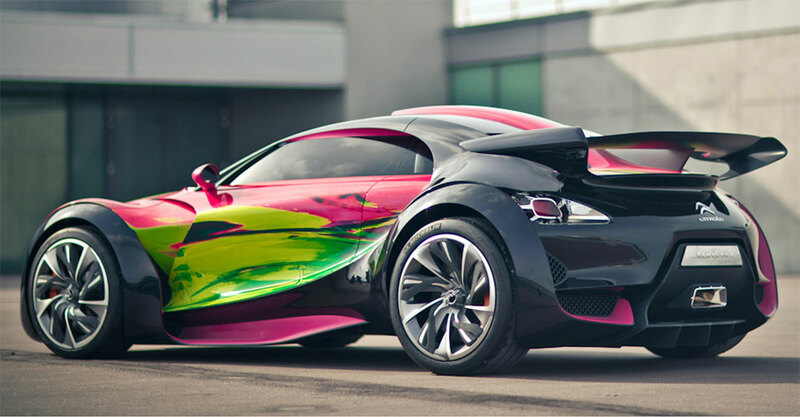 Fortunately, such things exist and here is one that embodies automotive monstrosity. The next thing you might ask is where does it come from? Any guess? Well, if you are betting on Japan, you’re right. The remarkable blend of Japanese underpinnings and European style, the limo shape is provided with a CD changer, air conditioning, power steering and windows, keyless entry, sunroof, ABS, an anti-theft system, 19-inch wheels and leather bucket seats. We’ll start by saying that the general flavor comes from the Ferrari F40. We’re talking about an iconic supercar that has managed to conquer the hearts of a infinite number of enthusiasts from around the world. “Around the world” is a good expression as this is how we’ll travel. We’ll leave the F40’s home country, Italy, behind and head for Japan. This is where you can find the vehicle we are talking about. As you can see, we’re avoiding mentioning the actual facts. Ok, we know that we can’t go on forever without telling you what the story is about – we’ll make it quick so it won’t hurt so badly: a stretch limo replica of the Ferrari F40. Zero South has come up with a modified version of the macho Hummer called the Biodiesel Electric Hummer. The tricked-out car is specially designed for an expedition to the South Pole, featuring a four-cylinder diesel Volkswagen engine, a modified powertrain and four electric motors. The Zero South Biodiesel Electric Hummer was originally setup to run on B99 fuel, but Jay Leno joined the team and modified the powertrain so that a four-cylinder diesel Volkswagen engine would act as a generator to four electric motors. Each motor would then provide power to the individual track it’s coupled to. It’s one heck of a Hummer, and we invite you to check it out for yourself in the gallery below. European Union (EU) funded the project, aims to make road transport revolution. Motor vehicles are based on wireless sensors connect to each other ‘land passenger train’, thanks to the intervention of drivers without the need for vehicles will travel on their own. The EU Commission launched in September 2009, Sartre (Safe Road Trains for the Environment) project entitled, motor vehicles, consisting of 6 or 8 vehicles in a ‘team’ event aimed at developers can travel more economical way. Management of the car’s leading ‘leader’ by submitting the hand wheel of the vehicle remote control system, capable of attracting the driver, thanks to this technology until the tracks which wants to, eat, work off your laptop computer and listen to music and read books. A taxi, bus or truck will ‘leader’ means an experienced driver will recognize the highway. Automobiles, including the convoy to become the leading vehicle navigation system and to communicate the sender / receiver unit needs to have. Train within the vehicle, at any time communications with cutting and control into the hands of the right way to take away their own direction. With Sartre project to reduce traffic accidents, and drivers to reduce fuel consumption by 20 percent, “unique” is aimed at presenting a comfort. The project, long distances each day, as well as the car’s passengers in commercial vehicles such as lorries and trucks are expected to cover. Carried out under the leadership of the Swedish car giant Volvo Sartre, to be implemented within 3 years in Europe. The first test drives will begin in the coming year. In total, 26 thousand 500 units in New York City Taxi Ford Transit Connect taxi tender Gölcüklü finals for the first time the New England region of the United States began the task. Ford Otosan, according to the company, the New England Auto Show Boston Cab Dispatch delivered tools to do the task begins, the state of Connecticut, the two companies can work with 40 pieces of natural gas has ordered 2011 model Ford Transit Connect taxi. Entering the North American market in 2010 and within a short time in the United States by the Boston Police Department Certificate of Conformity of the Ford Transit Connect taxi cab, was delivered to customers in the U.S. market first. New England Auto Show Dispatch’e delivered at a ceremony held in Boston Cab 2011 model Ford Transit Connect Gölcüklü taxis, the first Turkish taxi in North America are now starting to do the task. Boston Cab Dispatch, the Ford Transit Connect taxi drivers and passengers are preferred for the interior as well as its wide range of low operating costs to offer low fuel consumption, as announced. Boston Cab Dispatch purchased by the Ford Transit Connect taxi models previously used 2-liter V8 engine cylinder volume of engines with lower fuel consumption by 30 percent offer by taxis. Size, design and enhancement service that offers the driver and passengers in a Ford Transit Connect comfortable taxis, private payment and passenger information system for the Boston Cab Dispatch, as well as 8.4-inch screen donatıldılar information. New England New England Auto Show as well as two other companies announced that Ford Transit Connect Taxi preferred. Centers in the State of Connecticut of West Haven and The Yellow Cab Metro Taxi Company of Bloomfield, as 20 units can operate with natural gas has ordered Ford Transit Connect taxi. Car aims to equip its fleet more environmentally friendly cars of the Metro Taxi West Haven, Ford Transit Connect taxi with CNG announced that have taken the first step. The Yellow Cab Company of Bloomfield, the filolarındaki soon announced plans to more than 100 the number of natural gas powered Ford Transit Connect taxi. Is it really possible that skyrocketing gas prices — the kind that really mean that you have no choice but to spend your vacation at the gas station – could have an upside? For some of these photos, I wonder how it is possible that something like this happened. Seems unreal to me… What do You think? Powered by rainbows and happy wishes, it seems. The Fiat/Chrysler stand at the 2010 Detroit auto show is filled with mystery and intrigue. Well, not quite, but it is intriguing to see a Dodge Viper only a few meters (that’s how they measure things in Italy) away from a Ferrari 599XX. As for the mystery, there’s this Fiat 500 BEV. As you’ve probably already guessed by the title of this post, neither Fiat nor Chrysler published any details on the Fiat 500 BEV concept model that was showcased alongside the 500 Abarth at the American automaker’s Detroit Motor Show stand. Nothing new here as we’re in the dark about the “Chrysler Delta” also. The car’s name stands for Battery-Electric Vehicle and from what we’ve heard, it’s pure study as Fiat has no plans to introduce a production version of the concept – at least not in this form. To make a short story longer, the 500 BEV features a similar bodykit to the Abarth model minus the tail pipes at the rear as well as new alloy wheels. Inside, the concept model gets sumptuous leather seats finished in red and a sport steering wheel accented by red stitching while the traditional gear lever has been replaced with push-button controls. Taking something that’s basically the essence of legendary cheap European mobility for the masses to the most fun filled, showoff like, money draping car show in America however seems a bit too much. Even so, it didn’t stop Chrysler from giving it a go as they decided to bring the Fiat 500 to SEMA 2010. And not just any Fiat 500, with the car being reinvented nowadays as a fashion icon it had to come with American desirability. Therefore the Fiat 500 that will be shown off in Las Vegas in a few days is going to be prepped accordingly. The SEMA version of the Fiat 500 will be “dropped and widened”, will feature immense wheels and wide tires and a few weird modifications. The Fiat 500 Chrysler will be unveiling at SEMA has engine bits that wear a rather interesting badge, Mopar. That’s right, a small little European car going for sale in America with American tuning, an American owner and American marketing techniques for an American audience. Small and cute, Honda’s EV-N battery-powered concept super-mini is set to make its world debut at Honda’s Tokyo Motor Show stand next month. 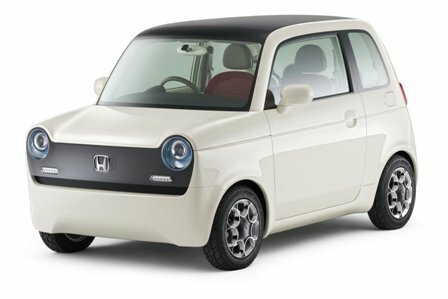 While those familiar with European models may see a pinch of Autobianchi A112 and bit of Fiat 500 (the new one) in the EV-N, the fact is that Honda’s inspiration for the styling came from its own N360 – a tiny kei car of the late 1960s that was powered by a motorcycle-based, 354 cc, air-cooled 2-cylinder engine producing 22 kW at 8 500 rpm. Now that’s a recipe for success. It was done back in 2005 and it as something nice to look at that also offered blistering performance, but since then things have changed. Jim Glickenhaus is our favourite American billionaire! This guy became very famous in the auto world a few years when he decided to turn one of his Ferrari Enzo into a one-off bespoke hyper car inspired by road-legal racing Ferraris of the 60s. The result of that was the Pininfarina P4/5, but that wasn’t the end for him, he is now working on an actual racing version of that car called the P4/5 Competizione and when it’s done he’s going to race with it. Good man! They’ve put together a sort of documentary of this car being built, and here’s the part 1 in which Jim himself talk you through his ideas. The performance has become as no longer enough and the racing inspired looks needed an update. Enter the Ferrari P4/5 Competizione, the racing version of the street legal single unit production. So far, the only thing we have available on this car is a set of renderings that have been released on the Italian manufacturer’s Facebook page. The racing car definitely looks like the original P4/5 with a few “go faster” bits attached to it but in actual fact the two are very different. For starters the chassis underneath the Ferrari P4/5 Competizione is taken from a Ferrari 430 Scuderia. Then there’s the suspension kit, the entire drivetrain and the V8 engine that powers the beast which is lifted out of the Ferrari F430 GT2 ALMS racer. According to Ferrari, they hope to have the P4/5 Competizione ready in time for the Nurburgring endurance race that’s scheduled to start on the 25th of June, 2011. We have had already heard of P4/5 Competizione. However, now its creator, James Glickenhaus with his team, has revealed the final renderings of the future P4/5 Competizione. The awesome beauty in red with white and blue straps on the hood will be built on a Ferrari 430 Scuderia base and will feature the suspension and V-8 drivetrain of an F430 GT2 ALMS racing car. The car will be offered in race as well as road legal car and work on P4/5 Competizione will be finished in time to prepare for the 24 Hours of Nurburgring on June 25, 2011. The renderings above give the clear picture of what the final product will look like. The design is somewhat close to that of P4/5 roadcar, but it has some race-specific components upgraded which is evident from the front splitter to the rear wing and a livery inspired by racing Ferraris of yore. The initial reports indicate that it will be classified as an experimental racer in the same genre as the Porsche 911 GT3 R Hybrid. James Glickenhaus and his team have revealed the final renderings of the future P4/5 Competizione. And if the final car will look like in these renderings, all we can say is just “wow!”. The Ferrari P4/5 Competizione will be offered in both racing versions, and also as a road legal car. The Ferrari P4/5 Competizione is being built on a Ferrari 430 Scuderia base and will feature the suspension and V-8 drivetrain of an F430 GT2 ALMS racing car. The team hopes that it can finish the build in time to make preparations for the 24 Hours of Nurburgring on June 25, 2011. The driver teams include: Nicola Larini, Mika Salo , Luca Cappellari and Fabrizio Giovanardi. 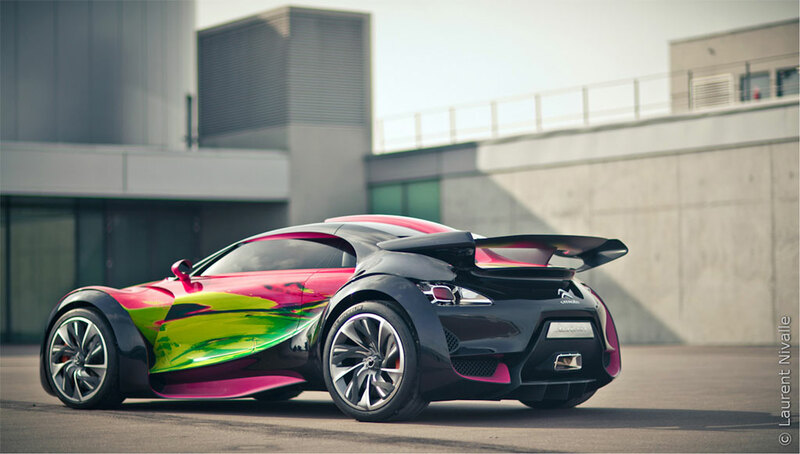 Citroen Paris‘in Champs-Elysées üzerinde onun işareti C_42 showroom ekranda yeni bir Survolt Art Car koymuştur. Doing ‘art cars’ has seem to become the thing to do for artists. 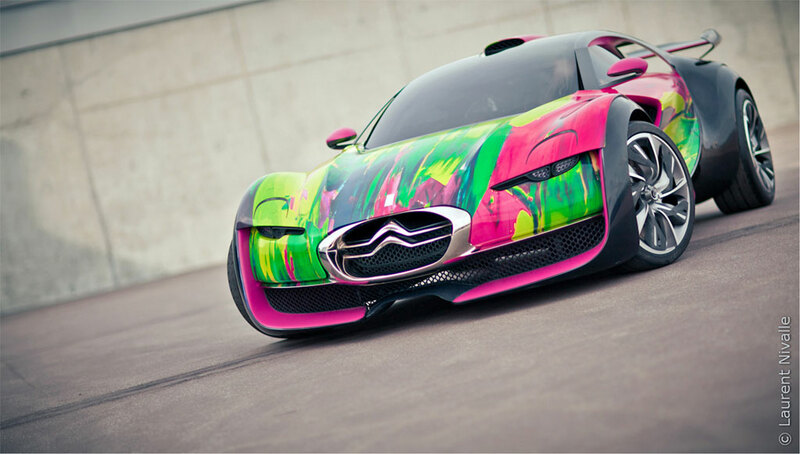 The latest art car comes from French artist Francoise Nielly, who applied the brush strokes to the Citroen SURVOLT Concept. Nielly’s worke is set to go on display at C42, Citroen’s flagship dealership on the Champs-Elysées in Paris. Çağdaş sanatçı Francoise Nielly Survolt Art Car yarattı. Onun bir “tasarım, canlı ve cesur renklerle yeni floresan boya planı zıt” all-electric yarışçı ekler. Citroen Nielly çalışmaları proje üzerinde sanatçı ile çalışmış olan ilk etapta Survolt ve tasarım ekibi için ilham biri olduğunu iddia ediyor. C_42 de yeni sezonda da Flavio Melchiorre yarattığı ödüllü kişiselleştirilmiş Citroen DS3 içerir. Onun DS3 tasarım ve açılış Citroen Creative Awards için 700′den fazla girişleri seçim olarak seçildi diğer kişiselleştirilmiş DS3 bir dizi seçenek yanında 2011 yılında devreye girecek. L’incrocio fra corse ed arte, connubio reso celebre dalle Art Cars di BMW, ha dato un altro frutto. Questa volta tocca alla Citroen Survolt, la piccola coupé elettrica del Double Chevron, “vestirsi” con un abito creato da un artista contemporaneo. It’s probably one of the best looking concepts at the 2010 Geneva Motor Show floor – in fact, it’s probably the best looking concept we’ve seen all year – meet the new Citroen SURVOLT. Based on the REVOLTe concept, the SURVOLT adds things like performance, cutting-edge technology, luxury and an outstanding sporty design into the mix. No performance specs were released, but we’re guessing it’s an upgraded version of the REVOLTe concept, which was powered by a rechargeable hybrid power-train consisting of a small engine and an electric-motor. 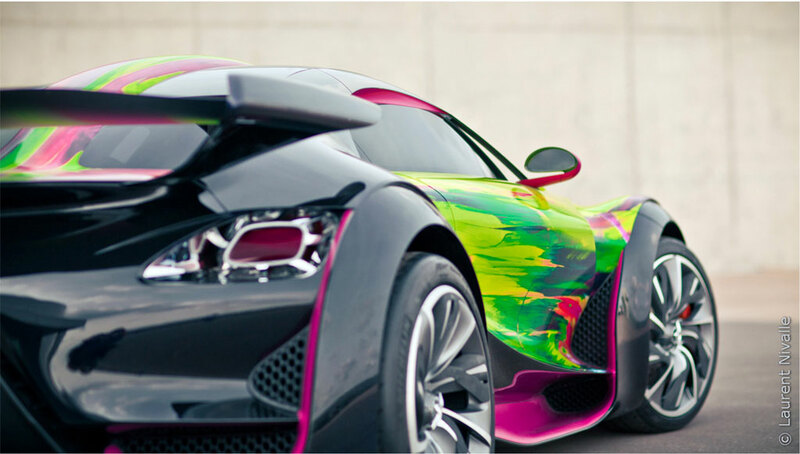 After making its first racing debut on the legendary Le Mans circuit, the Citroen Survolt has received a little head-to-toe makeover courtesy of the dynamic Francoise Nielly. Unlike Jeff Koons and Damien Hirst, who are tremendous artists in their ow regard, Nielly’s work encompasses the creativity and incandescent colors found in the style of art cars, leaving the task of turning the Survolt into a Nielly masterpiece as a beautifully simple one.